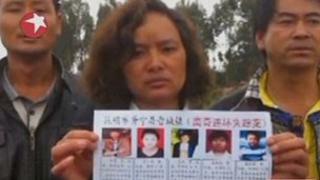 A man has been detained in south-west China by police investigating the disappearance of as many as 17 young boys and teenagers in recent years. The 56-year-old man was detained earlier this month in Yunnan province on suspicion of killing a teenager, Xinhua news agency reported. But police widened their investigation following reports of other missing teenagers in the area. Beijing says it has sent a team of experts to investigate. What started as a routine murder inquiry now appears could be the case of a serial killer, reports the BBC's Martin Patience in Beijing. The case came to light after a 19-year-old man disappeared in late April in Yunnan province's Jincheng county. Xinhua said police discovered some of the teenager's personal belongings while searching the suspect's home. Reports then emerged of others teenagers who had gone missing in the same area. Villagers had thought the teenagers had been kidnapped to work in illegal brick kilns, the reports said. There are reports that some of the other victims may have been dismembered. Local media quoted residents as saying they had seen plastic bags at the suspect's home that appeared to contain bones. Two senior police officials have also reportedly been removed from their positions for their handling of the case.